@CindyHydeSmith acts out on twitter and is now being #ratioed to hell……. Ratioing (yes, it’s really a word) is common enough on Twitter that it has its own hashtag: #ratioed (also really a word). It refers to the negative response that a tweet gets. Author Douglas HandshoePosted on November 28, 2018 November 28, 2018 Categories SopTags Senator Cindy Hyde Smith27 Comments on @CindyHydeSmith acts out on twitter and is now being #ratioed to hell……. Over the past 6 weeks or so I’ve been asked by numerous folks what is going on at the Sun Herald and besides another layoff to go with the one earlier this year the answer is not much. The complaints I’ve heard from older readers that grew up reading the daily newspaper do not seem very encouraging. I had a chance recently to spend a few minutes chatting with a member of the media, who told me about canceling their Sun Herald subscription because it had become so expensive while the content of the newspaper seems less and less. This was a productive exchange of information because I found out that those who canceled are offered far better renewal rates to come back on board. Not two days after I spoke with a nice lady in her late 70s who volunteered to me she too had just canceled her subscription because of the combination of price and lack of content. I assured the lady she would be getting a phone call to renew her subscription at a discounted rate, which I later confirmed did happen. The telemarketer promised this person that with the new Publisher in place content would be increasing. I took that promise as long term counterproductive sales puffery because it takes people to generate content and the paper isn’t expanding its workforce, the opposite is true. The next time the lady cancels, getting her back will not be nearly so easy. They sure did folks involving two separate incidents, the first involving the Delta water contract and the other involving lunch with developer Jim Macphaille at his restaurant 200 North Beach. This document is not yet online at Mississippi Ethics so Slabbed’s readers get the sneak peek. 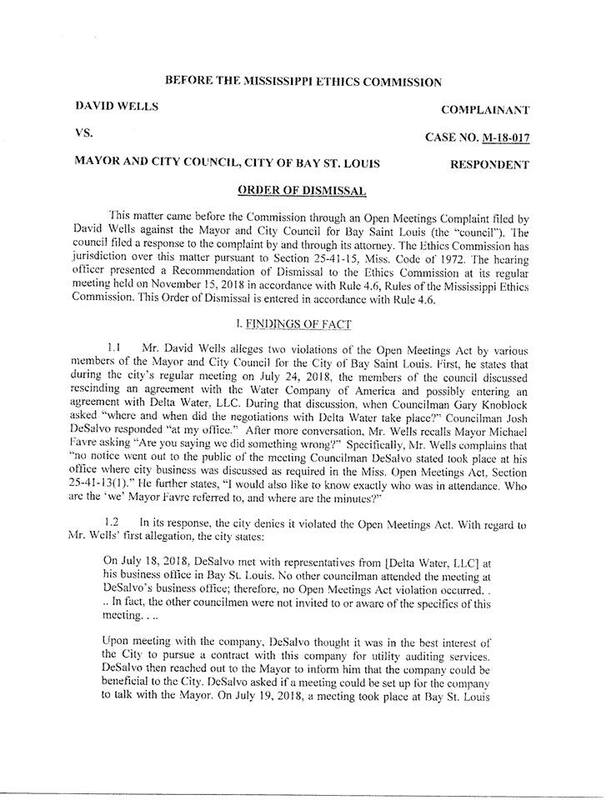 I am aware of several other ethics complaints that have been made against the City, I suspect each is very close to a resolution. Stay tuned. In 1987, the Congresswoman in the Northern California District where Nancy Pelosi lived, Rep. Sala Burton, died of cancer. Before she died, Sala asked Nancy to consider running for her congressional seat when it became vacant. Nancy got the message. She ran and won the first of seventeen winning races for congress. In her thirty one year congressional career she has been a force for liberalism and peace on every major issue or legislative initiative that has come before the congress. She’s served on the Appropriations and Intelligence Committees and occupied virtually all the leadership positions in the House plus four years as the only woman Speaker of the House in our history. Of the 10,947 individuals who have served in the House of Representatives since the founding of our country it would be hard to name five members who have had a greater impact on their time than Nancy has had on hers. Plus, it’s not over for Nancy, not by a long shot. On November 28, 2018 Democratic members of the House of Representatives will caucus to select their leadership team. The conventional wisdom holds that Nancy Pelosi will be the choice of an overwhelming majority of Democratic Members to be the next Speaker of the House. That’s the conventional wisdom. I’m a Nancy Pelosi fan so I hope the conventional wisdom will prove to be true. Continue Reading….. Tomorrow is the run off elections and while most folks are paying attention to the US Senate race here in South Mississippi there is also a Chancery judge runoff between Sandy Steckler and Margaret Alfonso. You do not find too much analysis of the nonpartisan judicial elections here in Mississippi and it is interesting in what one finds when the political affiliations are removed from the equation. Steckler took Stone County outright and won a plurality in Hancock County while Alfonso won a plurality in Harrison County. What each County had in common is the precincts with the highest numbers of African Americans broke consistently for Alfonso. For example Alfonso won the Bay City Hall precinct 250-111 over Steckler. Here in Stone County, New Hope went for Alfonso 228-149. In Harrison County Alfonso won North Bel-Aire 857-565. Overall, eastern Harrison County was Steckler’s core base of support while western Harrison County supported Alfonso. If the 6200 Harrison County votes for Diane Herman Ellis turn back out to support Alfonso this race is done with Alfonso winning. But since it is a run-off election turning out your supporters is key. Based on the voting patterns from November 6, having Mike Espy on the same ballot should help Alfonso. While the price tag of Medicaid expansion can come with some sticker shock, independent analyses have found that states often save money by insuring people — there are fewer instances of uncompensated care, and people are healthier when they have insurance. According to a 2016 report from the Robert Wood Johnson Foundation, 11 states experienced some savings from Medicaid expansion. Phil Bryant’s mishandling of this issue will be the biggest stain on whatever legacy he leaves the state and the refusal of Phil and the GOP to take Medicaid expansion to cover the working poor has contributed to some very real problems in Mississippi such as community hospitals breaking under the weight of having to eat the cost of uncompensated care along with the sheer human misery of not being able to have sufficient access to the health care system.